UPDATE! Comet Lovejoy has survived its fiery Dec. 15 plunge through the sun's atmosphere. Read the full story here. A newly discovered comet is set to make a death dive into the sun's atmosphere today (Dec. 15), and scientists will have a ringside seat to watch its fiery demise. 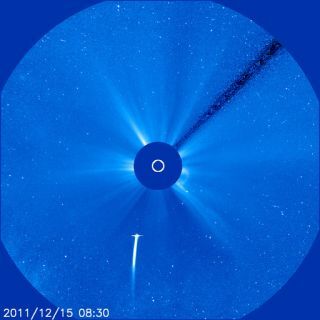 The ill-fated comet Lovejoy is on course to plow through the sun's blisteringly hot outer atmosphere - called the corona - making its closest approach to our star at around 7 p.m. EST today (midnight GMT on Dec. 16). At that point, Lovejoy should be just 87,000 miles (140,000 kilometers) from the solar surface. The comet is not expected to survive this close encounter, experts have said. But if it's any consolation to Lovejoy, the comet's last hours of existence will be well-documented for posterity. Scientists have trained a phalanx of satellite instruments on the comet, which is what's known as a Kreutz sungrazer. This series of images shows comet C/2011 W3 Lovejoy as it appeared to a remote controlled observatory in Malargue, Argentina on the mornings of Dec. 6, 7, 8, 10 and 11 in 2011, just days before it was set to fly through the sun's outer atmosphere. This image was taken by a skywatching team of astronomers that includes: Jakub Cerny, Jan Ebr, Martin Jelinek, Petr Kubanek, Michael Prouza, Michal Ringes. All Kreutz sungrazers — so named because their orbits bring them close to the sun — are believed to be the remains of one giant comet that broke apart several centuries ago. They're named after 19th-century German astronomer Heinrich Kreutz, who first demonstrated that such comets are related. NASA's Solar Terrestrial Relations Observatory (STEREO) and Solar Dynamics Observatory (SDO) spacecraft will be watching Lovejoy's death plunge closely, as will the Solar and Heliospheric Observatory (SOHO), a satellite mission operated jointly by the European Space Agency and NASA. Japan's Hinode spacecraft, which carries some NASA instruments, will also record the comet's last moments. Particle collisions may generate X-rays as Lovejoy streaks through the corona, so Hinode might capture X-ray images of the comet, researchers said. Though comet Lovejoy is just 660 feet (200 meters) or so wide, it should put on quite a show as it nears the sun. The comet could become as bright as Jupiter or Venus in the sky just before it's destroyed, according to the skywatching website Spaceweather.com. Lovejoy may end up being one of the brightest Kreutz sungrazers ever seen, researchers said. While the sun's glare will likely hide it from Earthbound skywatchers' eyes, there's a small chance that blocking the sun out — behind a building, for example — could bring the comet into view. WARNING: Never look directly at the sun with your unaided eye or through binoculars or telescopes without special light filters. Severe eye damage can result. The comet will make its close solar approach around sunset for observers across the continental United States, which could afford a viewing opportunity, experts said. "If you have one of those nice sunsets where you can actually look right at the sun, be on the watch for the comet on the left of the sun (for northern hemisphere observers)," Karl Battams, a scientist at the Naval Research Laboratory in Washington, D.C., wrote on the Sungrazing Comets website Wednesday. Battams runs the site, which is devoted to comets discovered by the SOHO and STEREO spacecraft. Battams cautioned readers, however, never to point a telescope or binoculars at or near the sun; permanent eye damage can result. Staring directly at the sun with the naked eye is also a very bad idea, so aspiring comet-watchers should exercise great care. Those of us on the ground may get a spacecraft's-eye view of Lovejoy's demise anyway. NASA is planning to set up a special website showing what its SDO satellite sees during the comet's death dive. The space agency will publish the website's URL sometime this afternoon via its website: http://www.nasa.gov, officials said.